The client owns a 40-acre woodland in need of rescuing as it was being taken over by vines, garlic mustard, and other invasive species. He was looking at developing a structure that would allow him to be more connected with the property as well as provide a place for his boat collection. 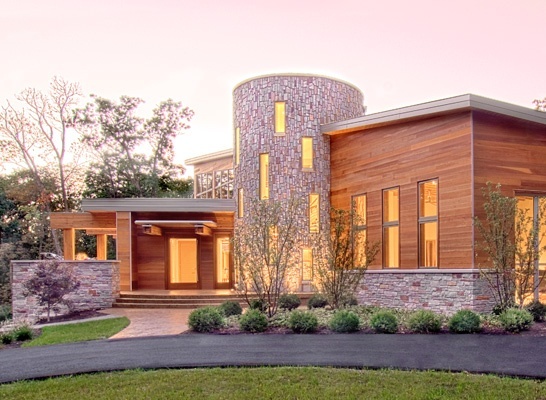 The home was to leverage green building practices, incorporate the latest technologies, and feature stone and wood all while treading lighting on the environment. Colman Woods is a 10,000 square foot architectural home featuring a trabeated design incorporating laminated columns and beams. Much of the structure is also the finish surface, such as polished concrete floors and insulated wood ceiling deck. This posed challenges for the mechanical and electrical system installations that were overcome with detailed planning and precise layout. 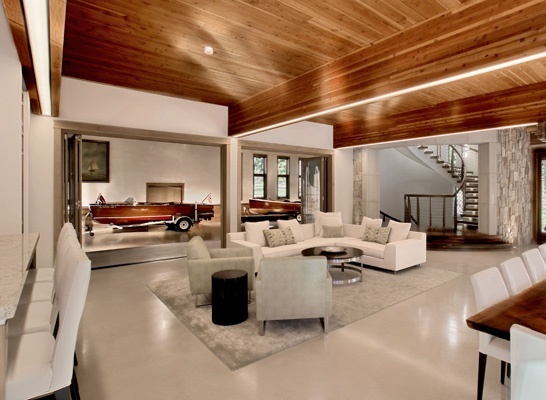 The home includes a boat showroom featuring a flat roof plane sloping in two directions. This interesting design feature required special attention to establishing column heights and joist bearing to achieve the precise angles. A circular stair tower, poured in concrete and clad in stone, features a spiral staircase of illuminated walnut treads and a stainless cable railing system, that sweeps gently within the tower with no connections to the tower walls. Green features include geothermal heat, distributed through the concrete floors and a living roof with a patio area accessible from the second-story office. PSG provided consultation throughout the design process and served as general contractor for the project. At the beginning we walked the thick woods looking for the ideal spot within the 40 acres to place this new residence. It was a team approach from day one for an assignment that was as much “art project” as “construction project”. Today, with the woodland restoration well underway and the residence tucked into the south sloping terrain, it is clear the right team collaborated on this impressive project. PSG is honored to have been selected to lead this team. Copyright © 2015 PSG, Inc., All Rights Reserved.